Spanish police this morning say they have arrested three involved in the hacking of Sony's Playstation Network, which lead to Sony shutting down the Playstation 3's network for a month, locking nearly 80 million gamers out of playing online. All three were freed without bail pending formal charges. The New York Times reports that they are expected to be charged with "forming an illegal association to attack public and corporate Web sites, a charge that faces a potential sentence of up to three years in prison." "#Anonymous has thousands of 'zombies' computers infected all over the world." The New York Times reports that according to police one of the hackers had "harbored a computer server in an apartment in the northern port city of Gijon, from which the group attacked the Web sites of the Sony PlayStation online gaming store." It is not clear if the three were the only ones suspected of being responsible for the massive hack attack or if this is the beginning of a series of arrests. Spanish police say the three are also connected to hacking attacks on banks BBVA and Bankia, utility ENEL and the governments of Egypt, Algeria, Libya, Iran, Chile, Colombia and New Zealand. The investigation by Spanish police in October 2010 after a denial of service attack was carried out on the country's Minister of Culture website. 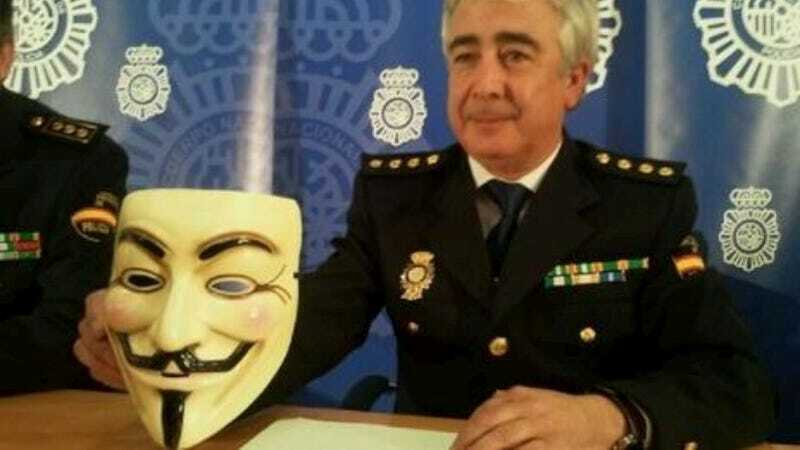 "Dear @policia, Expect us. #Anonymous." The organized hack attack forced Sony to shut their Playstation Network, Qriocity and Sony Online Entertainment services down and resulted in theft of personal data from millions of users. Some experts have said it is the largest hack attack in history. The arrests come days after FBI arrested a man whom they say is a member of hacker group LulzSec, accusing him of being involved in the attacks on Sony BMG, Sony Pictures and Nintendo USA's website. We have contacted the FBI, who is conducting the investigation into the attack in the U.S., and Sony for comment and will update this story when they reply. UPDATE: Reuters is reporting that the three arrested were not connected to the attack on the Playstation Network, contradicting the official statement from Spanish Police. They do not source the information.